Agricultural applications for soil fertility, healthy crops and increase yields. Electroculture is a group of techniques that uses electricity and magnetism to assist plant growth. Plants are sensitive to electricity and magnetism. Improved plant growth, quality and increased yields, are some of the noticeable effects. The technology can also be used to protect plants from pests and diseases. Electroculture synonymous with magnetoculture are generic terms used to describe an assortment of techniques designed to amplify and focus magnetic and natural electric forces of nature to boost soil fertility, and plant growth. In Nature magnetic and electrical forces always manifest conjointly. Magnetoculture refers more specifically to magnetic influences and electroculture to electric influences on plant growth and soil fertility. Electroculture and magnetoculture are based on a synthesis of recent discoveries in the field of Agriculture encompassing cosmic and telluric energies, electricity and magnetism. Photo : Giant Sunflowers growing in my garden in 2009. This garden has magnetic bees wax capacitors dug in at several places around them to increase the magnetism and earth electricity locally to benefit the plants and soil. Electroculture is the field of using electricity, electrical fields and currents to help soil fertility, plant growth and development. The electricity can be from natural or people-made sources. I choose to work exclusively with natural sources of magnetic and electric energy. Video : Presentation in english and german, made in Austria in 2013. 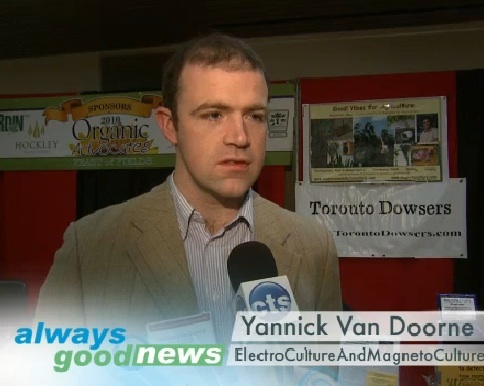 Video : Présentation about electroculture, from Yannick Van Doorne, in Vermont, at the north american dowsers convention from 2010. Many farmers know the benefit of electrically charged rain water from thunderstorms or the fertility of paramagnetic rock dust such as the kind you find in enormous quantities in the very fertile soils on and around volcanoes. This type of naturally occurring Magnetoculture inspires me to develop new techniques. Techniques of Electroculture have been developed through the ages with the use of antennas, magnets, pyramids, sounds, electric wires, natural batteries, magnetically or electrically charged rock dust and paramagnetic rock dust to improve crops in agriculture. Some of these techniques have had such good results that they doubled crop yields. Sometimes they are even used to improve weather conditions and decrease the force of storms or to bring rain to parched fields. The energies are applied to the seeds, plants, soil or to the water and nutrients. The application of magnetism, the cosmic and telluric energies, charged water, and sound can stimulate the growth of plants to a great extent. This little-known technology can accelerate growth rates, increase yields, and improve crop quality. It can protect plants from diseases, insects and frost. These methods can also reduce the need for fertilisers or pesticides. Farmers can grow bigger and better crops in less time, with less effort, and at a lower cost. You can download bottom of page a pdf essay on magnetoculture and a seven page summary of electroculture for your information. 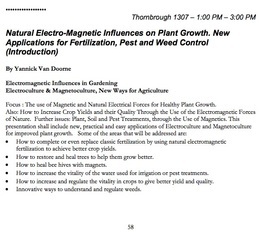 Yannick Van Doorne is engeneer in agriculture and biotechnology and has more then 15 years experience and know how about the applications of electroculture and the influence of electromagnetism on plant growth and development, water and soil fertility. Photo : The sunflowers grew even bigger and one month later there were huge sunflowers with heads like you see in the bottom left corner, heads of more then 50 cm diameter. to transform present day agriculture and gardening practices. I want to thank you all very much, all the participants and organizers of the Eternal Knowledge Festival 2012 and the presentations at Over the Moon festival 2012. I want to thank each of you for your support, encouragements and enlightening testimonials and knowledge we all shared together. I will definitely write a book for you now, to share all the details and knowledge I've built up over the years. I hope this will be usefull for many of us. Thank you again for all your encouragement and support, with the help of each of us we can achieve big change, we can make the world a happier place. All the knowledge is ready to enlighten us, we just need the modesty to listen and receive and do what we have to do to follow our inner guidance to make the best choices in each of our own occupations. In next few days, you will be able to access more information on this site : Including e-books and articles about electroculture, pyramids and much more. Video below : Complete presentation at the Over the Moon festival 2012. Yannick organizes almost every month workshops and courses about electroculture for people coming from all over the world. I can also organize workshops in english or other languages on demand. If needed you can help to translate to your language. This gives you an idea of the organisation of a two day workshop here in France or elsewhere. I can adapt the organisation and content to the personal needs. Innovative applications and techniques using natural electromagnetic energies in the garden and in agriculture, without fertiliser or pesticides. Techniques that deliver self-sufficiency and well-being for food, water, living spaces, and health every where in the environment. The aim of the presentation is to give ourselves clearly defined and solid tools using electro-cultivation in order to improve and enable organic farming with a view to a better outcome, both in terms of quality and financial results, while working always in harmony with nature. Electro-magnetic cultivation exploits the ‘free energy’ of the Earth and the cosmos for the benefit of farming. The use of these cosmic telluric forces results in healthy and abundant harvests, sometimes even shockingly so, in the absence of all chemical or organic fertiliser. Through lots of practical examples coming from his own personal experience, this speaker will present some simple theoretical aspects and their application of this technique whether by a professional or an amateur. Several complimentary subjects will be touched on. The origins of electroculture. The experiences of Georges Lakhovsky, Justin Christofleau and Marcel Violet. Why there has been a banning and suppression of this subject since the C19th. The unusual uses of pyramids in order to energise seeds, preserve food or increase harvest yields. Music and plants. How to save bees with electroculture. Techniques for energizing water for spraying or the irrigation of plants.. Solutions to treat mildew on tomatoes and potatoes. The origins of biodynamic techniques and its innovations. Agnihotra farming techniques that date back thousands are ayurvedic and still useful today. • Personal journey that led to this discoveries • History of electroculture • Theory and fundamentals • Electro-osmosis. Attraction effects of pointed metal. Frequencies of energy waves. • Practicals. Experiments and results. • Applications for gardening, vineyards, intensive horticulture and farm scale growing. • Treatment and prevention of plant problems like mildew, parasites, and poor growth. • Easy DIY constructions and more complex systems • Pyramid, its construction and use in the garden or agriculture • Ayurvedic Agnihotra techniques and their connection to biodynamics. We are increasingly witnessing the poor growth of arable crops, the spread of disease and parasites which result in the poor development of seeds and of our food, and thus following on from generation to generation because of ineffective growing methods. Several researchers have developed methods of stimulating seeds to the extent that they have resulted in healthier plants, more resistant to disease with ultimately a better yield and better quality and more vitality. Yannick VAN DOORNE has worked on this issue for several years and is ready to share with his his promising findings in this area and on-going practical applications. Applications for energizing seeds, caring for plants, growing vegetables, storage of food, the production of energy and de-toxification. The unfamiliar application of pyramids for energizing seeds, storing food or increasing yields. Everyone already knows about the use of a pyramid to sharpen razor blades. Do you know about the many other applications which could be very useful in everyday life? In the garden a pyramid structure made of copper wires could enable a yield of more than 40 potatoes per plant compared with the normal 5 to 10. Seeds energised with a pyramid could more than double a harvest. In this conference talk you will be shown numerous proven examples in the garden and in agriculture, and photos of these examples. The connection between electroculture and the pyramids. The electromagnetic relationship between the earth and the sky and pyramids. The uses of this in the past, today and tomorrow. Current research. A pyramid can also be used as a stand-alone generator of electricity. You will find out how. Certain experiments will also demonstrate the potential of a pyramid to neutralize doses of radioactivity, thus pyramid technology could solve our problems of energy supplies as well as of food. According to researcher Les Brown, a 4 metre square greenhouse under a pyramid is capable of producing enough vegetables to feed one person for a year. This pioneering research of Les Brown, Patrick Flannagan, Mary Hardy and others will be discussed. Numerous witnesses have suggested that pyramids are able to cure all kinds of illness even those thought to be terminal cancer, or help to develop spiritual awareness and abilities such as telepathy or ESP. A pyramid seems to exercise an influence on the whole environment, even to the point of detoxifying the atmosphere, cleaning chemtrails, reducing tension and aggression between people. The ancient techniques that come from Ayurveda, Agnihotra will be touched upon with the use of the pyramid and its beneficial effects, demonstrated for agriculture, the environment and health. You will learn the basic rules for making a working pyramid. How to use it, and what mistakes to avoid. You will learn how to make a stand alone greenhouse in pyramid form and electroculture, including internal heating thanks to a compost heap, which allows the growth of enough vegetables to feed 3 people for an entire year in a square surface area of only 5 metres per side or approx 25 m sq. Yannick Van Doorne will share these experimental results and his research since 1995 when he became interested in pyramids. In the last few years since 2008 he has been encouraged to intensify his research by his desire to verify and share the outcome of uncovering these secrets He is convinced that our ancestors built pyramids, still the largest structures in the world, because they wanted to communicate information and technologies of a fundamental importance for evolution and the survival of humanity. Speaker profiles : Yannick Van Doorne, Agronomist specializing in biotechnology. Enthusiast, researcher and developer of methods involving electroculture, music and plants, and pyramids. Saturday and Sunday: Depending on how the time goes, there may be a split between indoor and outdoor presentations. Normally the morning will focus on presentation of the more theoretical aspects indoors and the afternoon will cover practical exercises and demonstrations outside. Energy waves, Music and plants, Electroculture, Pyramids, Agnihotra, history and examples, experiments, applications, results. Practical demonstrations. The use of magnetic attractors, compasses, tools. The use and installation of magnetic antennae. How to do electroculture. Create an installation using the energies of the soil and the location. Ideas about geobiology applied to electroculture. Build a Lakhovsky antenna. Energise seeds. The practice of Agnihotra. Build a pyramid. Each participant will benefit from two days of intense learning, both practical and theoretical, about basic electroculture. You will be able to apply this knowledge directly on returning home to your own garden, field, farm, orchard or plantations. Tools, antennae and other electroculture products will be available for sale at special reduced prices for participants. Course venue: guest rooms in the village. The cours is given at my home in Ranrupt. Please bring: clothing in case of rain, boots, notebook and pen, good humour and an enquiring mind. Transport, by Train : railway station at Saint Blaise la Roche. Possibility of collection from station. Airport Entzheim Strasbourg. Meals : The cost of meals, full board, morning, midday and evening are included in the price of the course. From Friday evening to Sunday lunchtime included. All meals will be vegetarian and organic. Cheque amount .............. . payable to Yannick Van Doorne, Symphonie R&D Sarl. Cheques will be cashed only after the course. Other methods of payment are possible : credit cards, paypal, or part exchange of products or services can be discussed. In the event of cancellation, all will be reimbursed. Eternal knowledge festival. 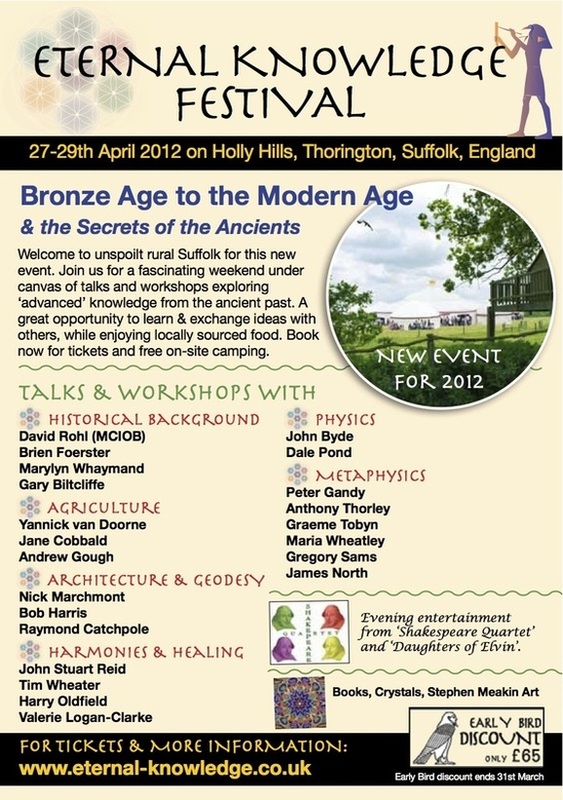 27 to 29 th April 2012 on Holy Hills, Thorington, Suffolk, England. 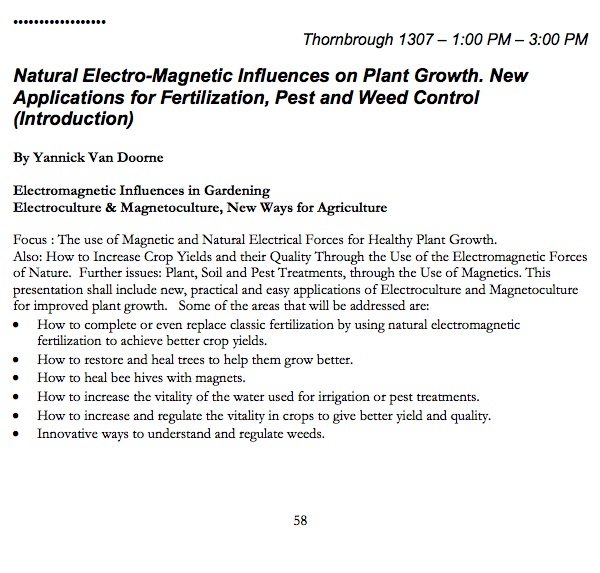 I will present electroculture techniques in detail how to use in agriculture and in your garden. Results, photos, practical exemples of what you can do to improve your yields, growth and healthy plants. Visit the site and come to this new exciting event. You can find a summary of the proceedings bottom page, of the presentation about electroculture at Guelph University of Canada. This was the first big event presentation about electroculture in Canada since several decades. Interesting fact is that in the seventies, more precisely 1976, on my birth year, there was a company existing called "Pyramid Electroculture Company" from Gilbert Milne that did some research about it and sold several systems in the region of Guelph. He also initiated some experiments with a professor at Guelph university of his systems. I didn't know this before but life synchronicities brought me to Guelph from Europe to do a presentation about Electroculture. This was a very nice new beginning for the development of electroculture in Canada. The local TV station interviewed me for the programme "Always Good News". Isn't it a nice interview to begin with to discover electroculture? Below you see the title and short summary of the conference at the organic conference at Guelph University. it was a huge succes. The room wasn't big enough to accommodate everyone and people had to stan outside the door to listen. Thank you to all, Canada, to make this happen. 22 august 2013 : Yannick Van Doorne wil do a presentation in England at the Truthjuice Gathering, from 22 to 26 August, close to Stonehenge. The event is located at Stonehenge Campsite, in the beautiful location of Berwick St James. 14 March 2013 & 18 April 2013 ; Holland, in Doorn, evening presentation, dutch and english, 14 march and 18 april 2013. There were also a lot in 2014, 2015, 2016 and 2017 ! If you want to organise one presentation, workshop about Electroculture, please feel free to contact me, I will be happy to help you for the organisation. Articles and books to download. Below you find a series of pdf articles and books you can download. I recommend the book "Sacred Mission" of Matteo Tavera, he was one of the first pionneers of the organic mouvement in the seventies in France, he is cofounder of the association "Nature et Progrès". His book is very enlightening with his vision and observations of electricity, electromagnetism in nature, how animals, plants and nature gain their energy and communication. I hope you will share your experiments after reading these books.